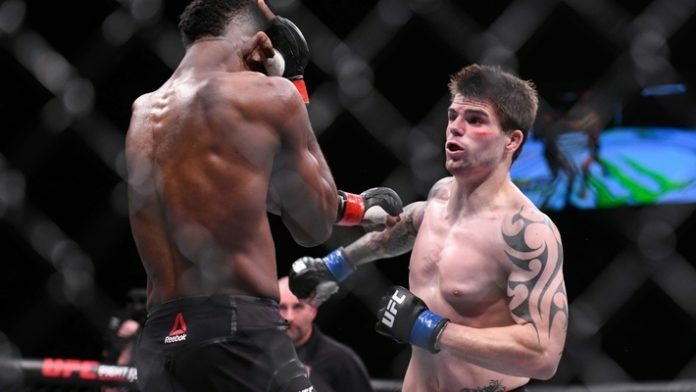 Following his UFC debut, Craig White sat down and spoke to us about the show in Liverpool, online experts and his future in the UFC. MMA News: You made your official UFC debut at the inaugural show in Liverpool. Whilst you came in on short notice against a well respected and ranked opponent, can you talk us through the moment that you got the call, the lead-up and the fight itself? Craig White: Getting the call was a big surprise but when it came to taking the fight it was an obvious choice on what to do. From there it was just about getting into the business as usual mentality and getting my head into training and preparing for the strain I was about to put myself under to successfully make it to the weigh-in. The only time I felt a bit out of my depth, or nervous, was during the open workouts and that was mainly down to not having experienced it before combined with not wanting to look an idiot with what I chose to do. When it comes to the fight, the feeling of being there was unreal. The atmosphere in the Echo Arena was insane and I felt really comfortable when I was in the cage waiting for the fight to start. I didn’t feel like I didn’t belong there and for the majority of the fight actually felt like I had a good level of control and wasn’t out of my depth at all. The whole experience was amazing and I’m glad I had the chance to be a part of it. MMA News: You recently came out and detailed the brutal weight cut you underwent, you lost 46 lbs for this fight in a two-week window. What was your routine like and do you feel that cutting so much affected your performance on the night? Craig White: Once I finished work I was straight into the gym with sweats on to start losing the weight. From there I just kept at that, doing as many sessions as I could between work and sleep, trying to shift as much weight as I could as quickly as I could. I would do 3 or 4 cardio sessions a day on an exercise bike and then have my MMA training on top. So some days I’d be doing 5 sessions and all this was whilst eating a minimal amount, barely enough to keep myself fuelled effectively. On the night I felt fantastic and my energy levels were high and I felt strong. It wasn’t until I took some shots to the body that the toll the cut took on my body became apparent and factored I not the result of the fight. MMA News: Another thing that was documented that not many people may know about is that you suffer from arthritis in your back. Have you had to adapt your training and style around the condition? Craig White: Believe it or not MMA actually keeps my arthritis in check. What I have is called ankylosing spondylitis and my consultants just call me an anomaly, as my movement should be very limited and make doing MMA very difficult. What they’ve said is you usually find that running helps maintain the movement and control the pain, whilst anything else will tend to cause a flare-up. I’m the complete opposite and can do basically every but run without causing a flare up. Which is fine for me as I find running the most boring exercise to do, ever. MMA News: You’ve entered what is considered an extremely competitive division in the UFC. What are your thoughts on those around you and is there anyone you’d like to specifically fight next? Craig White: I’m surrounded by a lot of gifted athletes. I’m excited that I get to mix it up with them and see all those in the division as fighters that can push me. I don’t have my eyes set on anyone in particular but I will be more than ready to take on whoever is put my way. Especially as I should have more notice than two weeks. MMA News: A lot of drama was created around Darren Till missing weight. Considering the cut you made, what are your thoughts on those who miss weight and what do you feel should be done to prevent this in future? Craig White: When it comes down to it there’s no excuse not to make weight. Though, like others, I do appreciate that there can be some last minute factor that plays it’s part and can screw it all up. But outside of that, if you’ve got 6 weeks notice that you’re fighting that should be ample time to make weight regardless of your current condition. I don’t think it’s ever something that will be prevented but whatever does happen going forward it needs to be athlete focused and friendly, not just a business decision or something caused by peer pressure. MMA News: On the subject of Till, your opponent, Neil Magny, was reported to be in as a replacement should Till be pulled, what was your thoughts and mindset at the time? Craig White: I couldn’t do anything but laugh. All I could think was “I’ve done this to myself, managed to make weight and now I’m hydrating and getting back to health I might not even be fighting.” It was a horrible feeling but it was something that was out of my control. From a business perspective I understood why that would end up happening and that it would likely leave me on the sidelines, but obviously, it still sucked massively. In was an uneasy wait till 1 pm fight day, to see if Till made the weight, but we carried on as we were as that’s what being a professional is all about. MMA News: You were one of a few call-ups from Cage Warriors recently, what are your thoughts on Cage Warriors and on Graham Boylan, how does he differ from Dana White? Craig White: Cage Warriors is a fantastic promotion and platform. The fact that so many of us have recently been signed to the UFC should be proof enough of that. I’m very gutted that I’m no longer a part of the organisation as it’s run so effectively with people who are really passionate about the sport. I didn’t have much interaction with Dana so it’s hard to say, but Graham is very good at what he does and is very dedicated as well. Cage Warriors and the UK MMA scene wouldn’t be the same without his involvement and all he does it constantly strive to move the UK MMA scene to new heights. MMA News: With jumping into UFC, the worlds biggest promotion, you’re now exposed to a much larger audience. How different has that been? Craig White: I’ve not seen it as being any different really. I’m quite chilled out and generally take it all in my stride, so have no intention of letting that change. It was a huge factor in my success with Cage Warriors so I’m hoping it will also play that part with the UFC. I do have more of a following now and it’s a great feeling to know that you’re gaining new supporters from all over the world. It shows the sport is growing an reaching that bigger audience day by day and it’s fantastic to be a part of that. MMA News: You detailed how you had people on the internet telling you how to do things, “experts” as you called them, how do you feel about all that? Craig White: Everyone online is an expert. Though the majority of these experts are just general fans who understand one side of what we do, they don’t understand the ‘behind the scenes’ parts. The article about my weight cut was always going to bring out mixed opinions and they have been very mixed. Don’t get me wrong, I know what I did was stupid and dangerous and regardless of what some people have said, I’m far from bragging about it. The article came about because Peter Carroll heard what I did and was amazed at how I managed to function throughout fight week with a good poker face, nobody knowing what state my body was actually in. My only question to them is, what would they be willing to go through to achieve a goal? MMA News: Now you’re in the UFC, when can we expect you back in action? What are your goals? Craig White: I want to get back in as soon as I can but within a sensible time frame. I’m hoping to be back in there around October but for now, I’m just ticking my training over nicely and taking everything a lot more seriously. Not that I did before, but with the level of the guys in the UFC I need to step it up that much more. I don’t have any set goals, I just want to go in there and have fun. I love what I do.